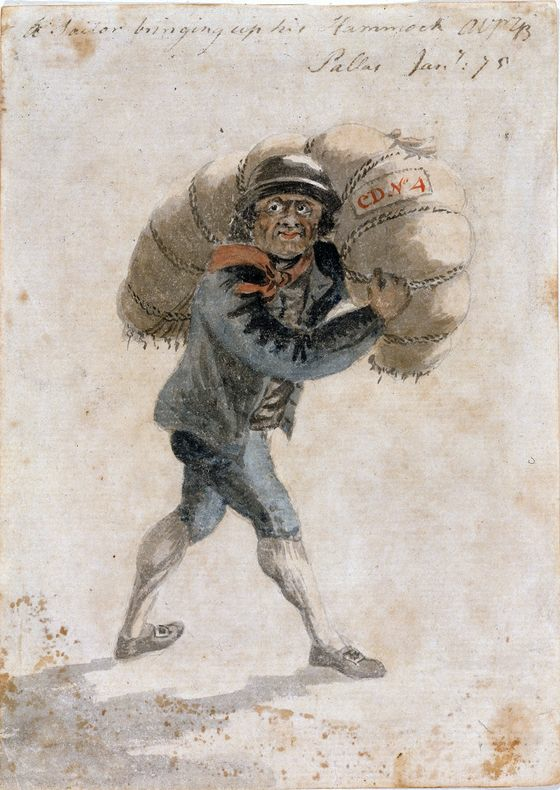 A sailor bringing up his hammock, Pallas, Gabriel Bray, 1774, National Maritime Museum. The hammock slung over our sailor's shoulder is marked with his initials, "CD." Initialing gear was standard for sailors in the eighteenth and nineteenth century, as evidenced by the artifacts recovered from the wreck of the General Carleton of Whitby. The hammock is bound over and over again with rope, until it resembles some sort of giant maggot. He wears a round "buck hat" with narrow upturned brim. The hair peeking beneath is the familiar loose hair, hanging about shoulder length. Bray skimped a bit on the details of the short jacket, but we can conclude that it is the fairly standard waist length blue wool worn with closed mariner's cuffs. The lines that Bray has painted on the lapels appears to indicate the jacket is double breasted, but I wouldn't swear to it. 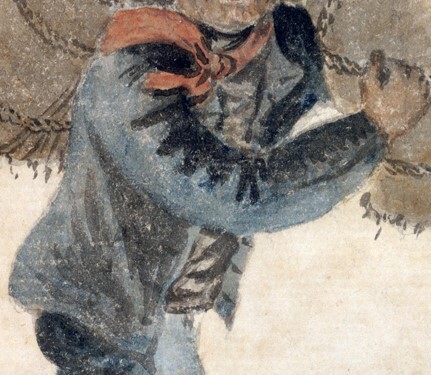 The neckcloth is a light orange (or faded red), tied in what appears to a square knot. It is difficult to tell if the sailor is wearing just his shirt beneath, or a waistcoat. 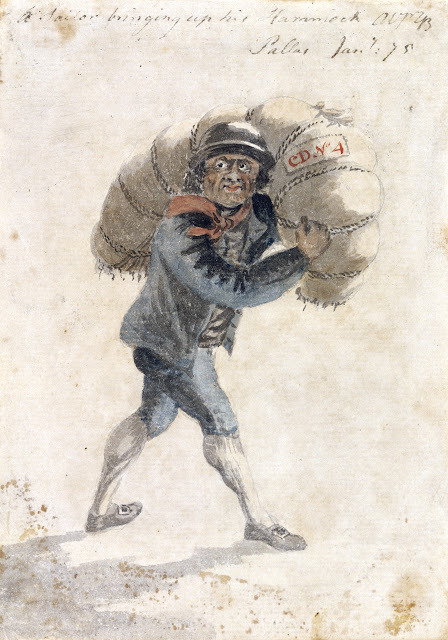 Breeches are often hidden beneath petticoat trousers (see Bostonians Paying the Exciseman), but here Bray puts them on full display. The sailor wears a pair of blue breeches, matching the color of the jacket and suggesting that perhaps they are cut from the same fabric. 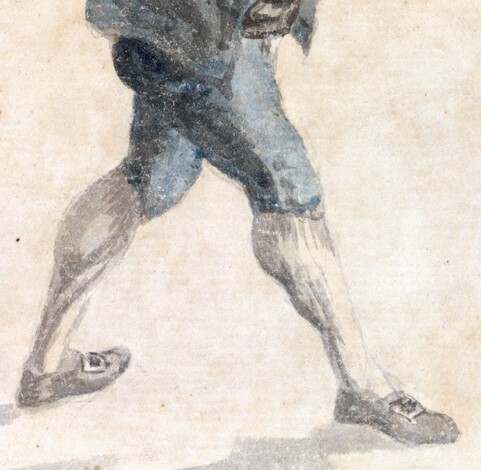 The breeches are tightly fitted above his notably pronounced calves, and the knees appear to be fitted with cloth covered buttons, as the color matches exactly. The sailor's stockings are white. His shoes are pointed toe with rectangular white metal buckles. Hi, Is it his own hammock ?I mean, a sailor bring on bord his own hammock in 18 th century , or the hammock is a part of accesories on bord ? That's a good question. My understanding (and I am certainly open to correction) is that the hammock itself was provided by naval vessels. The bedding may have come from the sailor himself. The mattress, blankets, pillows, and what have you I'm less clear on. 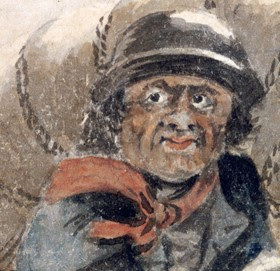 John Nicol wrote that he "put my bedding and chest on board a vessel bound for Leith," suggesting personal ownership, but he was neither moving from nor to a naval vessel.